Meditation Makes Me Happy — and It Can Make You Happy Too! If you do a Google search, you can find a ton of solid research proving that meditating is one of the best things any of us can do for our happiness and overall health. I’ll save you a little searching by recommending the Center for Greater Good in Berkley website, which has quite a few science-based articles on the benefits of meditation, along with a video featuring mindfulness maven Jon Kabat-Zinn. The research persuaded me to ramp up my own practice and to begin teaching “Meditating for Happiness” classes and workshops. I think people sometimes put obstacles between themselves and the ability to meditate, obstacles like “I’m not Buddhist,” “my mind is too busy,” “I don’t have time,” or more generally, “meditation just isn’t for me. I tried, and I can’t do it.” I also firmly believe that everyone can meditate, no matter one’s religion, schedule, or past experience. I thought, if I frame this as a happiness tool, perhaps I can reach folks who otherwise walk away from meditation. And teaching meditation, as it turns out, is a wonderful tool for making me happy, too. 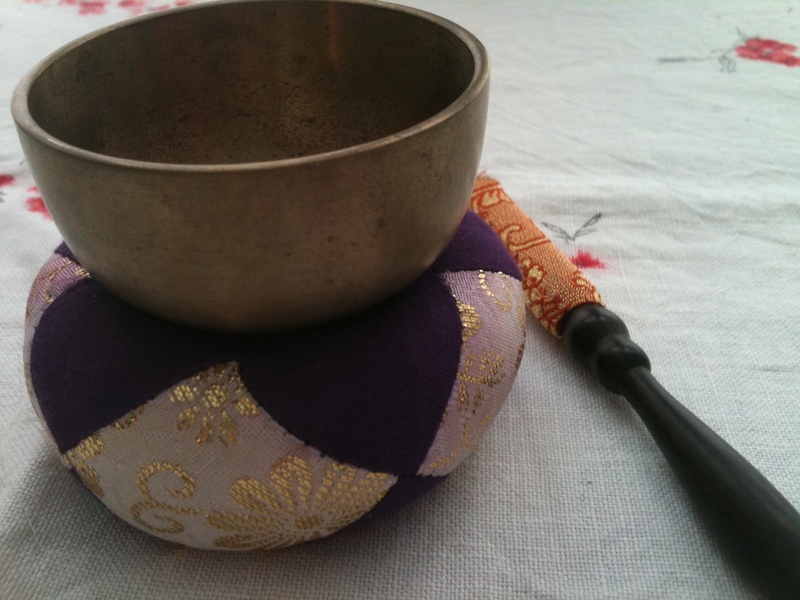 Tibetan Singing Bowls: Since I started teaching mediation, I’ve been experimenting with meditation options to see what I might wish to share in class. Recently, I searched for meditation music on YouTube, and found an 11 minute video of Tibetan singing bowls. I pressed play, wrapped myself in a shawl, and settled in. The music was wonderful, and helped me ease into a deep meditative state. After quite a while, though, I thought, “this seems longer than 11 minutes!” But I let that thought go, and returned my focus to the breath. A little bit later, I thought, “this is definitely longer than 11 minutes!” And still I returned my focus to the breath. Finally, I said to myself, “this is way longer than 11 minutes!” I opened my eyes and looked at the clock: I’d been meditating for 34 minutes! Then I looked at the video again. It is not 11 minutes worth of Tibetan singing bowls — it is 11 hours! This story amuses me no end, and I just love, love, love finding humor in meditation. Who knew it could be funny? Meditating Lakeside: A few evenings back, at the close of an especially fine spring Saturday in Vermont, I decided to meditate by the shores of the small lake across the street. The sun was starting to set and sparkling on the waters, the peepers were peeping, and multiple and varied birds were singing. A gentle breeze blew waves across the water and tousled my hair. From a distance I could hear a group of neighborhood boys happily playing on their paddle boat. It was an amazing moment in time to meditate. I was intensely aware of beauty and the vitality of life all around me. I was fully present, and it was blissful. Making Bad Days Better: I’ve had some sorrows lately, and other stressors. That’s okay, who doesn’t? Now, when some of the rougher moments of life hit me, I can turn to meditation as a way to calm down and get perspective. Sitting with my breath, or doing a loving kindness metta meditation, or focusing on forgiveness — none of these solve whatever the challenge is or make hard feelings instantly dissipate. But it helps. It really does. Meditating in Community: For eight years or so, my small community has kept alive a weekly meditation group. Our group is open to anyone who wants to sit together for roughly an hour on any given Sunday evening. We rotate houses, and whoever hosts keeps track of the time and offers up a reading. It’s totally non-dogmatic. The readings range from poems by Hafiz to writings by the Dalai Lama to a newspaper article — whatever the host is moved to share. Since we spend most of the time sitting in silence, you might not think this is especially social — but it is! Our weekly gatherings build and strengthen community relationships in a sweet, precious way. And, I get to visit other people’s homes. Given where I live in Vermont, some of them have outstanding views, making our time together even more delicious. And then there are the children: Even though most of you probably aren’t going to start teaching meditation classes (but yay for you if you do!! ), many of you have young children in your lives. According to Christine Carter’s book “Raising Happiness,” teaching children to meditate is one of the top 10 things you can do to help them grow into deeply happy people. Here, too, some of the perfume may land on yourself. I have started teaching my two-year-old granddaughter to meditate. First, I ask her if she wants to meditate. Sometimes the answer is no. When it’s yes, I sit her on my lap and ring the chime (pictured above). First we say, “Happy, happy, happy.” Next, it’s “Love, love, love” followed by “Thank you, thank you, thank you.” By then, she’s run out of patience and just wants to ring the chime, which is fine. One step at a time. I can’t know where this will lead, but, oh, how lovely are those shared meditations! Beautiful, Ginny! Maybe we can finally meet and meditate together sometime this spring/summer when I’m up in VT. My first time there this year will be Mem Day weekend. Yes, Mary, let’s make it happen! I’m teaching a three-hour “Meditating for Happiness” workshop in Montpelier the Saturday of Memorial Day weekend. I’ll be spending the rest of the weekend getting ready for our big national happiness conference, but I’ll be around and would love to meet and meditate with you! Our friend Lisa (across VT from you to the west) says you can never start too young to teach meditation to children. She wrote the book, in fact, Baby Buddahs. Sweet! I should get a copy of that for the grandchild!